I love the Holiday seasons. Christmas, Thanksgiving and Nowruz (Iranian New Year) are my favorites. There is something about the songs, colors, even the smell in the air which seems to reassure that no matter how bad everything else might be things are going to be OK. These are times of sharing, being with loved ones, giving, and at least for those few days bask in the wonder and the loving warmth of the season. This year was perhaps one of the best. As part of Dast2Dast I had a chance to share a tiny part of that warmth and love with our homeless neighbors. Not only, like every month through generous donation of time, food, and money from our donors we prepared a wonderful dinner for all to enjoy, but because it was Christmas, we also wanted to give everyone at the shelter a Christmas present. I had the good fortune to volunteer for our annual Gifts of Joy Project. Playing Santa Clause was even more fun than I had expected! I wish I had a better mastery of the pen as it is truly difficult to describe the pure joy of working on this special event. We provided Christmas presents for everyone in the shelter by collecting material contributions from wonderful donors and shopping for the remaining items with the generous monetary donations. 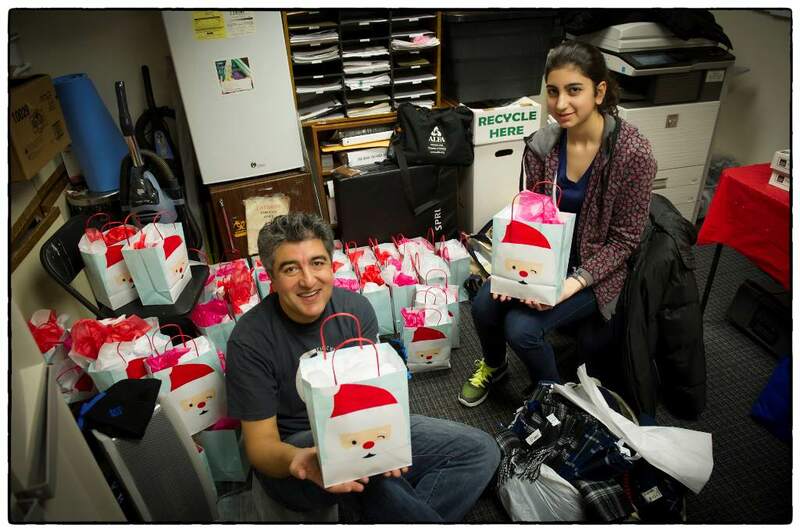 With the help and sales savvy of my cousins Donya and Mina, we managed to really stretch every dollar and put it to good use for a wonderful Christmas gift package for all the folks in the shelter. As I said it is hard to describe what was felt, and what was seen. For obvious reasons, we can’t take picture of the residents, as a picture would truly say a thousand words. All I can tell you is that there was no need to exchange words. The look on so many faces said it all. Not because of the gifts and what they were. After all, they were modest presents. The look of gratitude was for something else. It was for something that I think we all want, and some of us are lucky to have. It was for mattering, it was for someone actually caring for another, it was for not being alone at least for those passing hours. And, for us, it was the manifestation of that old cliché that brings the whole Dast2Dast family together; the joy of giving. Mehrdad Erfani lives in Washington DC area & is involved in different capacities with many charities & volunteer activities, some of which are Dast2Dast, Our Daily Bread, Fairfax County Commission on Aging, & Omid Foundation. He also volunteers as bike patrol on both W&OD & C&O Canal trails. Additionally he participates in as many charity bike ride as possible & encourages others to do so as well to raise funds & awareness for Autism, Multiple Sclerosis, Diabetes, Family dysfunction, & Child and Sexual abuse. He loves spending time with his nieces & nephews along with the rest of the Erfani clan & close friends. In his spare time he enjoys hiking, long distance biking, & traveling which his job has enabled him to do extensively. He is a consultant with Rockwell Automation which has given him the good fortune to help customers with their manufacturing challenges & in the process has provided the opportunity to see a good part of the planet. نمیدونم میتونم فارسی رو بخونید یا یا نه چون مطلبتون به زبان انگلیسی بود . به هر حال میخوام بگم که افتخار میکنم که هموطنی مثل شما دارم .کسی که شادیهاش رو سخاوتمندانه با دیگران قسمت میکنه. براتون آرزوی سلامتی و بهروزی دارم . کار یک نفر نیست، کار دهکده دوستی است. ادبیات نگارشی مطلبی که فرستادم و اون چیزی که بدستتون رسید ظاهرا باهم متفاوت شد . فرقی نمیکنه . ففط عرض ارادت یک هموطن بود وبس .